The Center for Applied Policy in Education (CAP-Ed) at UC Davis facilitates the nexus of research, policy, and practice with a commitment to eliminating inequities in schooling and providing learning opportunities for diverse students. CAP-Ed connects education leaders and practitioners with nonpartisan, research-supported information and expertise from scholars and policymakers. Our services and publications foster a thoughtful, well-informed education system in California encompassing policy makers and those implementing policy in schools and districts. Publishing and distributing syntheses of current research and policy to inform policymaking and policy implementation throughout the education system. Hosting seminars for policymakers and education stakeholders with experts in key education topics. Assembling collaborative systems and instructional rounds to mobilize intersectional, reform-oriented networks. Conducting new policy research on key education policy topics such as school finance, accountability, and curriculum and instruction. Bryk, Anthony S. Organizing Schools for Improvement : Lessons from Chicago. Chicago: U of Chicago, 2010. Print. Hattie, John. Visible Learning : A Synthesis of over 800 Meta-analyses Relating to Achievement. London ; New York: Routledge, 2009. Print. Senge, Peter M. The Fifth Discipline: The Art and Practice of the Learning Organization. 1st ed. New York: Doubleday, 1990. Print. CAP-Ed provides a broad range of services to both state policy makers and local school and district educators. 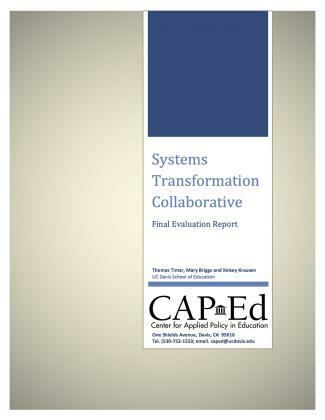 CAP-Ed helps schools and other education organizations synthesize current research, conduct research, evaluate programs, develop reform and school improvement strategies and implement them.